With Easter just a couple short weeks away, now is the time to plan your celebration. Here are some tips to help, from DealDash. Planning a fun Easter celebration is essential, especially if you have young children. You need to plan a great day for everyone to be able to enjoy this holiday. Here are some ideas for planning a memorable Easter celebration, from DealDash. The first thing you definitely need to do is to plan an Easter egg hunt. Nothing says “Easter Party” more than an egg hunt. It would be very smart to assign each child participating their own egg color so that everyone will be able to find the same amount of eggs. You also might have to get creative with your Easter egg hunt should the weather not be good. You can do the eggs one of two ways. You can do the traditional way of dying real eggs. Or, alternately, you can choose to buy plastic eggs and put tiny surprises in them instead. It’s up to you. Another thing that you should do is plan some simple Easter crafts for the kids to do. You will want to plan accordingly for the different ages of kids participating so that everyone will be able to participate. This would be a great way for to kids to make something to remember the celebration. For the youngest kids, age 2-4, just coloring an Easter picture might be enough to keep them occupied. For older kids, though, there are many fun things they could do, such as decorate their own Easter basket. If the weather is nice the day of your celebration you should take things outside. Have some outdoor games planned for the kids if the weather permits you to enjoy the nice weather. It would be a great way to enjoy the day. You will also want to plan for some fun food for everyone to enjoy. You will likely want to stick with something simple as you will have younger kids enjoying the food you have prepared. Finger food and foods that are simple to eat are great ideas so that everyone will find something that they will enjoy eating. Things such as a fruit plate, veggie sticks with dip, or even pizza would be great for your celebration. Planning an Easter celebration is a lot simpler than you would think. You just need to be sure you are planning age-appropriate activities for the kids participating to do, along with some delicious foods! You will be all set to enjoy this special holiday. Thanks so much for reading this DealDash article on an Easter celebration. Don’t forget to check back every day for new articles here. Also read our sister blog, DealDash Tips. We love to hear from our readers. Want to treat your child on Easter? Go check DealDash for toys and baby items. DealDash has games as well. Visit DealDash now to see how much you can save. Have a great time on DealDash and happy bidding everyone! This sponsored DealDash blog article was written by Dawn E, a mother of 3 who loves DealDash. Dawn was compensated for writing this article. This blog is written by real DealDash customers. The opinions and advice shared here represent our customers’ views and not those of the company. Read even more on DealDashTips.com, or on her own blog, DawnBlogtopus. This entry was posted in Kids and Parenting and tagged baby, celebration, child, children, Deal Dash, DealDash, DealDash Auction, dealdash auctions, dealdash.com, Easter, family, games, holiday, kid, kids, party, toys on March 16, 2018 by . Easter is tomorrow, have you got everything set up for the kids or grandkids? If you need a little help, here are some tips from DealDash. What does your family like to do on Easter? Do you have any fun family traditions? Easter started as a religious holiday, of course, but there are many people who don’t practice religion who enjoy the fun secular aspects of the holiday. Here are the best things to do on Easter when you have kids or grandkids. In a previous DealDash article, we talked about coloring Easter eggs. If you followed my suggestions, you should have lots of eggs to hide for your Easter egg hunt. If you didn’t dye your eggs, you will need to run out today and pick up some of the plastic eggs and put candies and little surprises in them to hide for the kids. After hiding your eggs, be sure to jot down where you hid all of the Easter eggs in case they are not all found by the egg hunters. This is especially important if you’re hiding real eggs, as these will eventually go bad and start to smell really terrible. Having small kids means making Easter baskets! You can get baskets that are pre-filled with small toys and candy from the big box store or even the supermarket. Personally, though, I prefer to buy an empty basket and fill it up myself. This way I know that my children will like everything that’s in the basket, and I can keep the candy to toy ratio in check. I would much rather they have a few small toys, stuffies, or games than too much extra candy. Also, my kids go crazy for those tiny clementine oranges, so those are a great healthy treat to put in their baskets that they love. What child doesn’t enjoy seeing their cousins and grandparents? Be sure to invite the relatives over for the egg hunt, and ask them to stay for an Easter brunch as well. Easter brunch is typically ham or turkey and can include many side dishes such as glazed carrots, fruit salad, and pastries. As you’re enjoying the brunch with your family, try to include the children in some of the festivities. Children love to feel helpful, let them set the table, fill the water glasses, or take the guests jackets and put them away. Before, during, and after the brunch, be sure to take lots of photos of the happenings. You never know how many more Easters you will get with great-grandma, so it’s always wise to preserve these wonderful family gatherings. Thanks so much for reading this DealDash article on Easter fun. Don’t forget to check out sister blog, DealDash Tips. If you have any requests for specific articles, please feel free to leave a comment below. We love to hear your ideas! Do yo need some last minute Easter items? Check DealDash for all of your home needs and more. DealDash has everything. Visit DealDash now to see how much you can save. Good luck and happy bidding everyone! This entry was posted in Uncategorized and tagged cooking, DealDash, DealDash Auction, dealdash auctions, dealdash.com, Easter, family, kids, kitchen on April 15, 2017 by . Having kids or grandkids means that you’ll be decorating some Easter eggs this weekend. Here are some tips and tricks from DealDash to make the process go more smoothly. Decorating eggs is a fun pastime that kids and adults can enjoy together. You don’t have to be a regular churchgoer to enjoy the secular parts of Easter. There are so many great things about decorating Easter eggs. It’s fast, fun, and the best part is you can eat them when you’re done! Decorating Easter eggs with a kit is, of course, the easiest way of all. There are a variety of egg decorating kits at any big box store, supermarket, and drug store. Just pick one out and follow the directions on the back of the box. However, I don’t find that the kits produce dark or vibrantly colored eggs. If you don’t care too much what your end result looks like and are decorating them purely for fun, then a kit is the easiest way to go. Mix 1/2 cup boiling water, 1 teaspoon vinegar and 10 to 20 drops food coloring in a cup to achieve desired colors. Dip hard-boiled eggs in the dye solution for about 5 minutes. Use a slotted spoon or tongs to add and remove eggs from the dye. Double-dip some of the eggs to make new and interesting colors, or make them half-and-half. The newest innovation in egg decorating is to use shaving cream! Yes, the fluffy stuff you use to shave your body. Try out this fun, new way to decorate your Easter eggs this year. Spread your white shaving cream out on a cookie sheet. Squirt a little food coloring across the surface of the shaving cream. Use a chopstick to swirl the colors around in the shaving cream. Take your dry and cool hard boiled egg and roll it around in the shaving cream. Put shaving cream eggs on a paper plate and allow them to dry for 5 minutes. After 5 minutes, wipe off the shaving cream and rinse with water, and voila! Beautiful swirly colored Easter eggs. Thanks so much for reading this DealDash article on decorating Easter eggs. Don’t forget to check out sister blog, DealDash Tips. If you have any requests for specific articles, please feel free to leave a comment below. I welcome your suggestions! Kitchen items are essential to this recipe. Check DealDash for all of your kitchen needs and more. DealDash has everything. Visit DealDash now to see how much you can save. Good luck and happy bidding everyone! This entry was posted in Uncategorized and tagged craft, decorate eggs, decorating, DIY, Easter, Easter eggs, eggs, family, holiday, kids on April 12, 2017 by . Easter is coming. 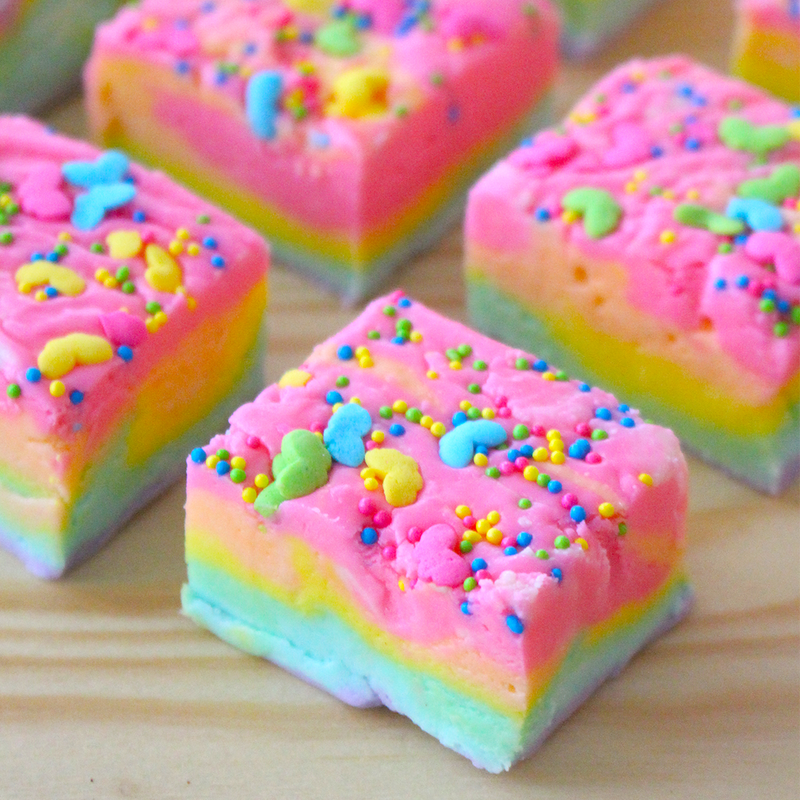 Whip up a batch of unicorn fudge to please everyone with a sweet tooth. Have you ever tried unicorn fudge? It’s delicious, adorable, and fun to eat. It’s easier to make than traditional fudge, and it comes out so much prettier. You can adjust the recipe to make different colors and add different toppings. Grab your kids or grandkids and start a batch of unicorn fudge. Here is the recipe from DealDash. Grease and spread foil over an 8×8 glass dish. Heat up the sugar, butter, and half-and-half in a saucepan. Turn the heat to medium and bring the delicious mixture to a boil. Stir very well with a wooden spoon for about 4 minutes. Stir in the marshmallow crème and chocolate chips. Remove the mixture from the heat. Fold in the marshmallow crème and chocolate chips, stirring well with the wooden spoon until fully melted and has a smooth texture. Separate the fudge mixture into however many bowls as you would like different color layers. If you just want 1 color then 1 bowl is fine. However, if you want 4 different colors separate into 4 different bowls, and so on. Add a few drops of each food coloring to each bowl. Stir well until the colors are well mixed. Layer each color into the 8×8 glass dish. Smooth out each layer with a rubber spatula. Use a chopstick to swirl the colors around gently if you choose. You may skip this step if you would like the colors more defined. Sprinkle the fun sprinkles over the fudge. Place the fudge in the refrigerator to harden up. Allow it to chill for at least 6-12 hours until the fudge has completely hardened. Slice the unicorn fudge into pieces. You may add more sprinkles if you so desire. These little fudge pieces come out so cute! They are just adorable and perfect for Spring birthday parties or Easter brunch dessert. Give them a try and see if you like them better than the traditional chocolate fudge pieces. This entry was posted in Uncategorized and tagged candy, cooking, Deal Dash, DealDash, DealDash Auction, dealdash auctions, dealdash.com, dessert, Easter, fudge, kitchen, recipe on April 10, 2017 by .